Spending Mother's Day on the Trail is a perfect way to show the "mom" in your life how much you appreciate her. Whether it is your mom, wife, sister, aunt, grandma, or friend, they will be treated well with a glass of wine in their hand. New releases, live music, munchies, brunchies, food trucks, vendors and more! Bear River Winery Old Town Auburn – chocolates and something special for Mother’s Day. Bear River Winery Meadow Vista – cheese, crackers and chocolates as well as something special to celebrate our 6th anniversary of the Tasting Room being open. Cante Ao Vinho – Brunch, see website for details and music by the Albertson Duo. Le Casque – Happy Road Farms selling fresh flowers and Bouquets. As well as Henna work by Ali Futrell. Ciotti Cellars – Live music on Saturday. On Mother’s Day we will be releasing our Orange Moscato, a dry white wine. Dono dal Cielo – Join us for Mother’s Day at the Vineyard from 12-5pm. Live Music from 1-4pm by Dust In My Coffee. Cousins Maine Lobster Truck will be on site with a delicious menu for purchase. Pop up store filled with Touchstone Crystal by Swarovski so you can purchase a special gift for Mom. Please bring your lawn chairs or blankets, there is limited seating. Mount Saint Joseph – Vin Uva Tasting Room -For Mother’s Day (and Mother’s Day week) we will be featuring a new “Frose” – a wine slushie made with our Rose. For Mother’s Day Weekend: Friday evening – the music of Rock Salt and Nails.PaZa – We will be having a Boutique Brunch on Saturday, May 11th from 11am-2pm. This is a ticketed event $25 for the general public and $20 for wine club members. Buffet style brunch includes 1 glass of wine or sangria. Local vendors and craft booths for shopping. Look for a ticket link via our facebook page. Pescatore – We will celebrate moms on Mother’s Day with a glass of champagne. Rancho Roble – Mom’s ROCK Sunday!!! 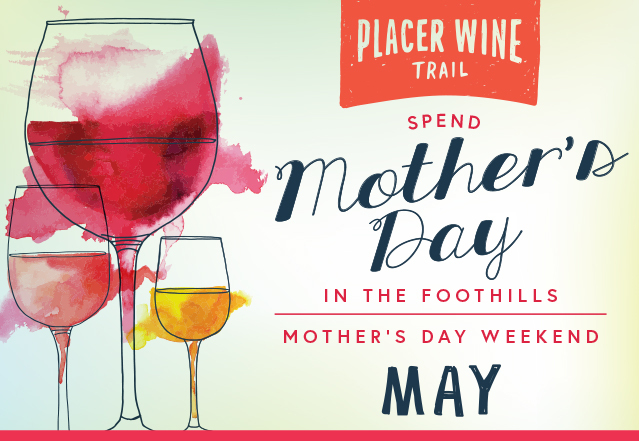 Rancho Roble Vineyards is celebrating mom with live music and a food truck sure to make your mom’s day special. Bring your favorite lawn chair and/or blanket and sit by the pond and enjoy sunshine and love! Secret Ravine – Secret Ravine Vineyards will also be open Mother’s Day, noon to 5 offering several wines and a new Grenache Rose for your enjoyment. Vina Castellano – Brunch! Two seatings for Mother’s Day. One at 10am and the other at 12pm. Each seating is limited to 50 people. Tickets can be purchased through Eventbrite. See website for details. Wise Villa Winery – Treat the women in your life to a wonderful Mother’s Day at Wise Villa Winery. Enjoy wine tasting, wine by the glass/bottle, sparkling wine (Blanc De Noir and Blanc De Blanc), winemaker’s sangria and from the bistro – gourmet starter plates, and a special chef-prepared lunch entree. RESERVATIONS NEEDED, please call 916-543-0323. Bistro open 11am-5pm. *All activities are subject to change. Check with each winery for specific details. There is no overall Trail event ticket for this weekend. All events organized by individual wineries.